We spend approximately 90% of our time inside. It is important to us to create environments that promote a happier, healthier life. 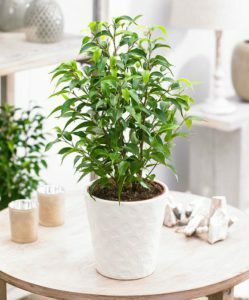 A key design aspect that is easy to add to your home is the introduction of house plants. 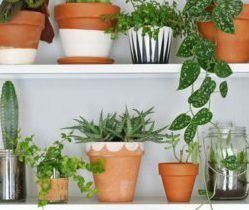 Plants are a great way to improve the quality of air which is much needed in our London homes. 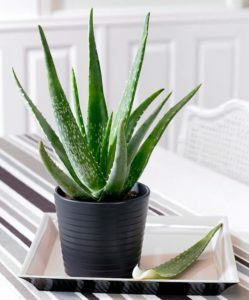 Aloe Vera – great to improve air quality producing oxygen and absorbing carbon dioxide throughout the day and night. It has medicinal properties, within the gel in the leaves, which are full of vitamins, enzymes and amino acids. Aloe is in more danger of being over watered than under watered. Water once a week in the warmer months and every two weeks in the colder. 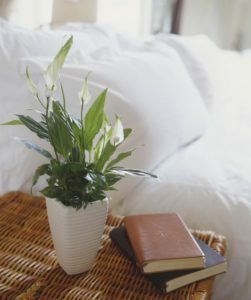 Peace Lily – a beautiful flowering plant that can improve the air quality in your home by 60%. It reduces mold spores and is great in bathrooms keeping the tiles and surfces free from mildew. They like shade and damp soil. 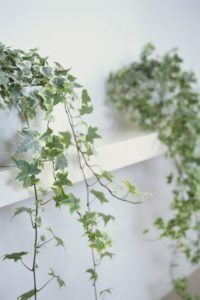 English Ivy – can increase your focus as it absorbs traces of benzene (a naturally occurring carcinogen) and leaves the air fresh. It absorbs formaldehyde (commonly found in household cleaning products). Ivy likes to be kept on the dryer side so check the soil before watering. 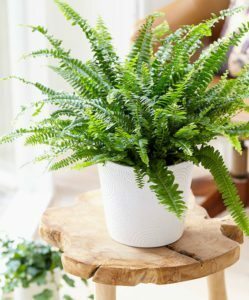 Boston Fern – extremely popular not only for its beauty but also for its health benefits. They act as humidifiers and can help to restore moisture in the air (great for dry skin sufferers). They like indirect sunlight and to stay moist. Weeping Fig – filtering formaldehyde, xylene and toluene it leaves the air cleaner and healthier. They like to be kept in a bright spot with high humidity and moderate watering. They also do not like being moved.